Yin Yoga is an undeniably transformative, rejuvenating and meditative practice in which deep-stretching postures are held for 3-5 minutes. Stretches and sensations go deep beyond the muscles and into the fabric of the body (connective tissue). Little to no muscular energy is used, and props help support the stretches. Unlike Restorative Yoga, Yin Yoga challenges practitioners to find a deep stretch and a sustainable “edge” in each posture. Based on Chinese meridian theory, this practice nourishes the subtle and emotional bodies. Appropriate for practitioners of all levels. In a world of fast pace everything, Slow Flow Yoga takes the time out to find peace and harmony within our mind and bodies. It promotes efforts to find your edge and deepen your practice. Benefits from Slow Flow Yoga include; increased strength and resilience. greater awareness of postural fundamentals and more focus on mind-body integration. Deep Stretching, long holds, relaxing music. Great for athletes, anyone who works at a desk and anyone who needs some stress reduction. Yin yoga was developed to penetrate deep into connective tissue expanding flexibility and aiding healing. Yin Yoga poses are mostly seated and held for 3-5 minutes, each to loosen blockages in the body and increase energy flow. 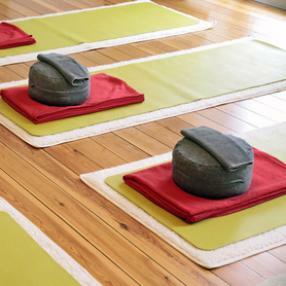 Restorative Yin Yoga offers you an opportunity to surrender, slow down, and find balance in your life. We primarily focus on floor poses that are held with muscles relaxed for 3-5 minutes. Holding the postures will gently and deeply stretch connective tissue of the lower back, hips, spine, and legs. As we slowly work into the connective tissue of your body, you will find more freedom and mobility in your joints. The result is greater ease, comfort, and flexibility in all of your activities. We focus on the breath, being present in the moment, relieving tension, and letting go. The Yin practice includes powerful mental and emotional benefits as you become quiet, still, and mindful of the present moment. 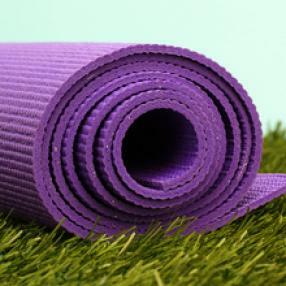 Yin Yoga greatly compliments your more active (Yang) yoga practices and activities. Yoga Nidra is a deeply restorative practice that promotes physical, mental, and emotional relaxation. All that it requires is resting on the floor with your eyes closed and listening as you are guided through a body scan, breath awareness, and practice is designed to withdraw you from distractions from the mind and body, accessing deeper realms of the mind, allowing you to release the sources of tension, anxiety, and unwanted habits. A regular practice of Yoga Nidra results in feeling less stress, increased energy, mental clarity, and a better nights class will include some gentle movement, with the balance of the practice experienced lying in Savasana. Yin Yoga is a gentle way to stretch the deep connective tissues of the body. We hold asanas for a longer period of time to gently stretch tendons, fascia, and bone. As a result of this practice you will find a new freedom in all the other activities you do off the mat. Yin is a counter practice to our Yang. We will hold postures for at least 5 minutes to allow our connective tissues to release. Yin also targets the meridians of the organs. A great balance for your week.